Politicians who sit in their gilded House and Senate seats funded by the NRA telling us nothing could have been done to prevent this, we call BS. They say tougher guns laws do not decrease gun violence. We call BS. They say a good guy with a gun stops a bad guy with a gun. We call BS. They say guns are just tools like knives and are as dangerous as cars. We call BS. They say no laws could have prevented the hundreds of senseless tragedies that have occurred. We call BS. That us kids don’t know what we’re talking about, that we’re too young to understand how the government works. We call BS. Let’s look at some of the facts that back up Gonzales’s statements, and call to action. The NRA has become a fanatical political lobby. Politicians who sit in their gilded House and Senate seats funded by the NRA telling us nothing could have been done, we call BS. Founded in 1871 to advance marksmanship and firearms safety, the NRA kept to that mission for more than 100 years. But in 1977 hardliners took over the organization, and turned it into the nation’s foremost gun lobby. Now, the NRA spends millions for politicians that block any and all gun control legislation. And in 2016, it spent $31 million on just one race — to elect Donald Trump president. Meanwhile, on the income end, both gun manufacturers and individuals contribute millions to the NRA. As a strong supporter of gun rights, I am flabbergasted and appalled by this “ad.” How embarrassing for you to promote hate and fear, especially within the context of gun ownership (a place where hate and fear must be kept *most* in check). Gun control laws work all around the world. The United States’ assault weapons ban of 1994 to 2004 showed a reduction in crime using the banned weapons. But, because the law had grandfathered-in millions of assault weapons and high-capacity magazines, the overall reduction was negligible. But Australia, which Gonzales mentioned in her speech, had a different story. Prompted by a massacre of 35 people by semi-automatic rifle in 1996, Australia banned those weapons later that same year. The country also bought back the banned weapons, and accepted other weapons voluntarily turned in, resulting in a 20% cut in the number of guns among the population. The law also brought stricter gun licensing and registration. And studies strongly point to the law helping to bring down gun death and injury. Incidence of gun homicide was down 43% (from .43 to .25 per 100,000), and of gun suicide down 58% (from 2.6 to 1.1 per 100,000). And gun massacre (of four or more people at once, excluding familicide) was down to zero (from 13 over 18 years to none over 22 years). Furthermore, it just stands to reason that less guns makes for less gun death. And simple statistics bear that out. 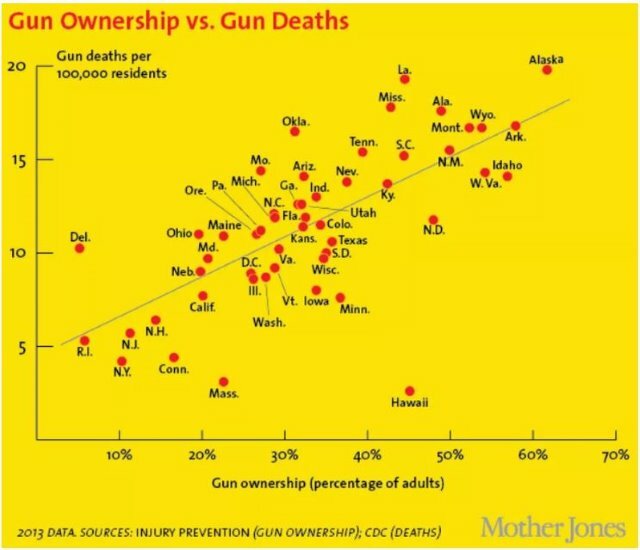 Both state-by-state within the USA, and country-by-country across the world, there is a strong correlation between guns per capita and gun deaths. The United States with about 88 guns per 100 people has 91 gun deaths per 100,000 people. 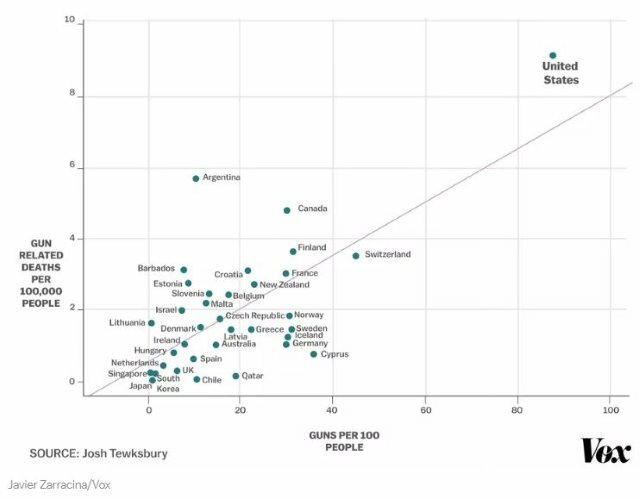 The next-highest in guns per capita is Switzerland, with about 44 per 100 people, and about 37 gun deaths per 100,000. Near the low end is Japan, with about 1 gun per 100 people, and about one gun death per 100,000. … [T]hat is the second time UVU has made the GunFAIL list, the first being in May 2015, when one police academy cadet accidentally shot another while taking his gun apart, forgetting there was a round in the chamber. Back in 2012, a student at Weber State University in Ogden, Utah, accidentally discharged his concealed weapon. And it was in Taylorsville, Utah, in September 2014 when a sixth grade teacher injured herself when she accidentally shot and shattered a toilet in the faculty bathroom with her (not very well) concealed handgun. So, you know, keep that all in mind as more states begin to permit campus carry and allow teachers to arm themselves in the classroom. While there are cases where people successfully use a gun to protect themselves, there are many more cases of accidental shooting death or injury. The website, shootingtracker.com, which Gonzales mentioned in her speech, lists and classifies all reported shooting incidents. Between April 3rd and July 7th this year, there were 227 defensive usages that stopped a crime, but almost twice as many (448) accidental shootings, most (385) of which caused death or injury. Assault rifles are too lethal for civilian use. The injury along the path of the bullet from an AR-15 is vastly different from a low-velocity handgun injury. … The high-velocity bullet causes a swath of tissue damage that extends several inches from its path. It does not have to actually hit an artery to damage it and cause catastrophic bleeding. Exit wounds can be the size of an orange. You have no constitutional right to an AR-15. For many years, the well regulated militia has been the National Guard. So, the Second Amendment, like the Third Amendment, had become a useless relic — until 2008. That was when the Supreme Court, thew out long-established precedent, and created out of the Second Amendment a right to keep a registered and licensed loaded handgun at home, on the grounds of self-defense. To do that, Justice Antonin Scalia, the self-avowed constitutional literalist, discounted the plain purpose literally expressed in the first half of the Second Amendment. Then, overlooking the arguments at the time of the Bill of Rights being written, he reached back to a 17th century English law, to try to justify the new right that he created. But even Scalia did not claim an unlimited right. His opinion said that “dangerous and unusual weapons” are not protected. Bans on concealed weapons, and bans on weapons in places like schools and other public buildings, by his opinion, are still constitutional. As we have seen, assault rifles like the AR-15 are unusually dangerous, so would not be protected by Scalia’s new self-defense-by-gun constitutional right. That us kids don’t know what we’re talking about, that we’re too young to understand how the government works. We call BS. In addition to peaceable assembly, the students have pushed for registering and encouraging citizens to vote on this issue. So, these actions look to be the very height of democracy in action. And the students keep at it. They are now on a summer barnstorming tour of the country to speak for sensible gun control and to register young people to vote. Chicago Cookout and Voter Registration Drive, The Renaissance Park, 1 p.m.
Naperville Town Hall, DuPage Unitarian Universalist Church, 6 p.m.
STL Town Hall, The Commons Auditorium, Cardinal Ritter College Prep High School, 5 p.m.
Kansas City Town Hall, Reardon Convention Center, Wyandotte Ballrooms, 6 p.m.
Omaha Town Hall, Hilton Omaha, Blackstone Ballroom, 2 p.m.
Sioux City Youth Meetup, North High School – Media Center, 11 a.m.
Cancelled due to weather – please join our other Cedar Rapids-area event in Marion! Marion Town Hall, Linn-Mar High School Gymnasium, 7 p.m.
Janesville Youth Meetup, Pontiac Convention Center, 2 p.m.
Madison Town Hall & Voter Reg Party, Alliant Energy Center, 5 p.m.
Hennepin Town Hall, Osseo Senior High School, 6 p.m.
Community Celebration At the Park, Corcoran Park, 12:30 p.m.
Community Celebration At the Park, Woodlawn Park, 3 p.m.
Bismarck Town Hall, Bismarck Event Center, 6 p.m. 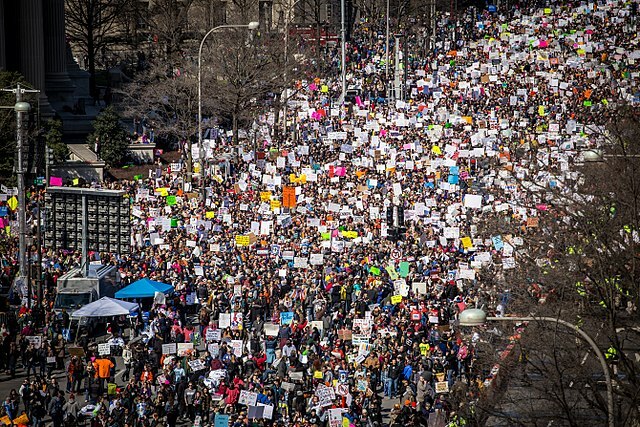 Image: By Phil Roeder from Des Moines, IA, USA (March for Our Lives) [CC BY 2.0, via Wikimedia Commons] March for our Lives on Pennsylvania Avenue ,Washington, D.C., March 24, 2018.